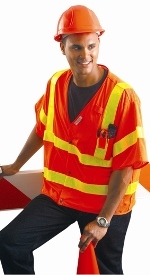 A Class 3 Safety Vest is designed to provide the highest degree of visibility for workers that are in high risk environments. A Class 3 Vest provides more visibility than Class 1 Vests and Class 2 Vests. They were first defined in ANSI-107-2004 which was later updated to ANSI-107-2010.